I was in Rollag, Minnesota last weekend, the land of steam for Labor Day weekend and the Western Minnesota Steam Thresher's Show. 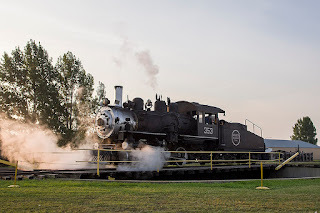 On Sunday morning as I was heading to breakfast they were just moving the locomotive I get to help fire on out of the roundhouse and on the turntable to move it to the mainline to start taking passengers around the grounds. The sunlight and cool morning made the steam billowing out of the cylinders show up nicely. The locomotive is an ex Soo Line switch engine and is 97 years old this year.